This latest revision has a strong focus on teamwork and includes new material on reconceptualizing collaboration and team-based problem solving. The authors give us a powerful vision of schools as learning communities, not just for students, but also for adults, teachers, parents, and school administrators. This second edition has been expanded to include interagency connections and ways to develop partnerships with schools. 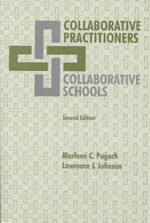 The school–family collaboration chapter covers cross-cultural situations and gives practical strategies. Much more emphasis is given to diversity in this revision. You’ll find proven activities and checklists at the end of each chapter. Problem solving, team teaching, and working with supporting groups are all part of this second edition. 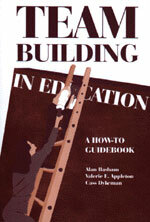 This guidebook presents both a rational and specific technique for improving teamwork in educational settings. You'll find information on creating effective teams and what makes them work. It shows how to increase collaboration and teamwork among educators, social workers, school counselors, psychologists, community leaders, and parents. It is designed to provide a blend of research and organizational development theory, step-by-step processes for leading team-building meetings, and information to expand leadership qualities. The authors of this book support collaboration in teacher education programs as a shared educational agenda between special education and general education. They show the need to jettison the old separate parallel system of teacher training in favor of new roles and responsibilities for faculty members. The book presents the efforts of ten selected exemplary collaborative teacher training programs from across the country. Detailed discussions of each reform approach demonstrate how and why these particular programs are effective. 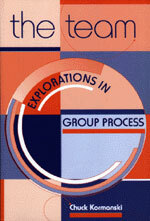 The authors suggest joint planning of courses and team teaching. The text builds upon constructivist thinking and appeals for integrated curriculums. 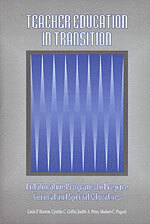 A critical resource for deans, educators, and faculty as they attempt to fashion changes within their own institutions, the book ends with ten powerful postulates for change and success.